Just after dawn on Saturday Morning, my brother and I arrived at the gates of the Colden Center at Queens College, where Aung San Suu Kyi was schedule to speak later in the morning. A crowd had already started to form. Burmese Americans traveled from near and far to greet her. Some camped overnight with picnic blankets and lawn chairs. The queue was colorful, dotted with vibrant sarongs and longyis matched with sandals and sneakers. 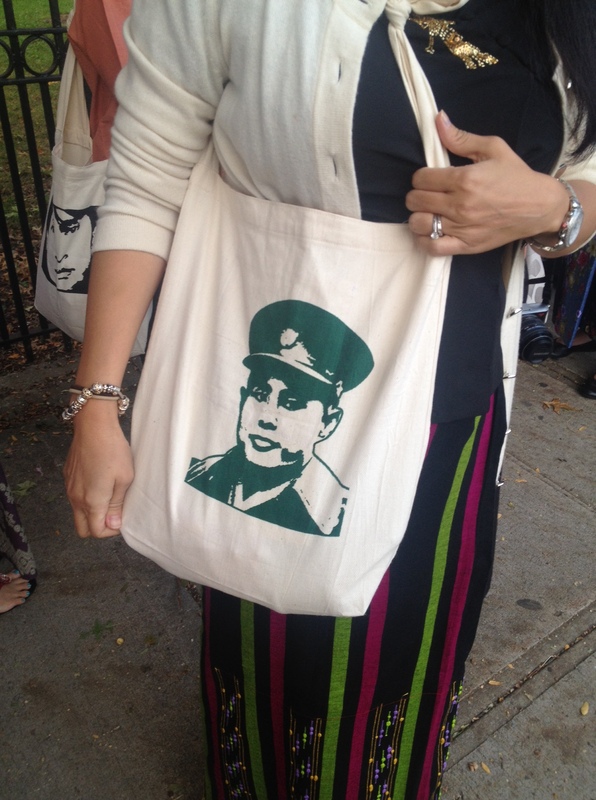 I spotted a tote bag bearing Aung San Suu Kyi’s face on one side, and her father, Aung San on the other. Some came carrying red flags with the golden peacock, the symbol of the National League for Democracy. 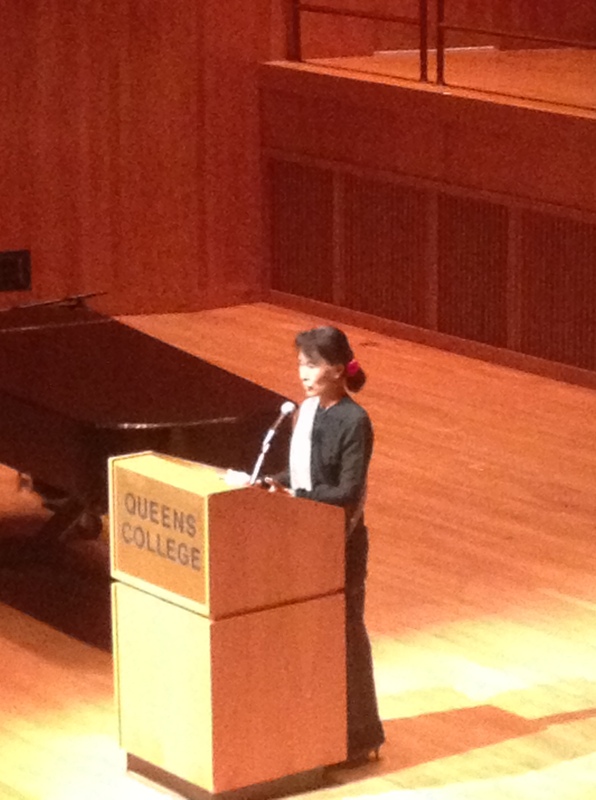 A few hundred had arrived and a few thousand were expected to fill the hall during her Burmese address at 10:30 Am. Prior to this, there was an event in English at 9 am, organized by Queens College at their Lefrak Concert Hall. Congressman Joseph Crowley, a Queens College graduate, hosted the program. Crowley, wearing a Saffron colored tie for the occasion, noted he, like Aung San Suu Kyi, was currently in the minority party in our legislature, and that maybe he and Daw Suu, the leader of Burma’s opposition party, should exchange notes. Crowley acknowledged both Secretary Clinton and former first Lady Laura Bush’s support for Burma, and hoped for more bipartisanship on this issue. When Crowley learned of Suu’s visit to the U.S. to receive the Congressional Gold Medal, he told her the people of New York wanted to see her. “We want to give you a very warm, a very Queens, New York City welcome.” Actress Angelica Huston read from Suu Kyi’s seminal essay “Freedom from Fear.” Christine Quinn, the first female speaker of NYC’s City Council, offered her gratitude to the newly elected Burmese MP. The city council has been active on fighting repression in Burma, and Quinn acknowledged comptroller John Liu in the audience who has been addressing this issue with respect to the city’s pension funds. Aung San Suu Kyi received a standing ovation and assumed her place at the podium. Dressed in dark green and black Burmese dress, with flowers in her hair, she addressed the crowd unscripted, giving a glimpse into the way her mind worked. She began talking about her love of New York when she had lived here many decades ago. “I loved the city at a time when people thought it was terrible. It was the only city in the world where I never got lost.” When she first arrived in 1968, she remembered her surprise to see that New York, a city of skyscrapers, did in fact look exactly like the post cards. She had a similar feeling when she was brought to Insein Prison for the first time. She was surprised that prison was just like the places with iron bars she read about in books. She recognized the similarity in these two moments, not to say that prison reminded her of New York (it did not), but to note that we can be surprised when we discover first hand that things are just like what we have been told. This applies too to the struggle for democracy and human rights in Burma. “Many young Americans take it [democracy] for granted,” she said. “I always say to my friends who live in democratic countries: ‘Don’t take it for granted.’” She felt that those who didn’t vote showed “a lack of respect for a right you should guard with your life.” Democracy requires practice and we must practice our duty as a citizen. “Duty may sound like a boring word,” she said, “but duty is very stimulating if you really think about what duty is.” She argued challenges are exciting, and “the greatest challenges are the ones where you have to struggle with yourself. Speaking to a college crowd, she said, “Young people here should not be ignorant of [the conditions] of young people elsewhere” After 50 years of military rule, the education system has “tottered” in Burma. [She was about to say collapsed, but opted for a more “moderate” word]. “At one time, Burma had the best education system in South East Asia, ” she continued. But now there is a growing gap between the few well-educated and the masses who “through no fault of their own have been ill prepared for the world into which they were born, ” she said. “There is nothing better in the world than to see young people who are caring and who understand the needs of others. I think human beings are born generous, but sometimes we have that generosity squeezed out of us by circumstances in which we have to grow up. Don’t let go of your generosity.” She pointed to Crowley who is almost 6’5”. “Look at your colleague, how large he is, his heart is big in every way.” Laughter warmed the room. Throughout this event and the later event in Burmese, her responses showed her sense of humor and her wit. After every remark in English or Burmese, the audience laughed and cheered or waved their red NLD flags. What I noticed is that Aung San Suu Kyi’s humor was never used to deflect the truth or evade a question, but rather to illuminate truth and provide a sincere response. She went on to study his life very closely. “Although he was part of Burmese army, he was not really a man of violence, not really a man who preferred over confrontation to reconciliation… He was a man of quiet, deep, sincerity and tremendous warmth. Singer and songwriter Carol King, another Queens College graduate, concluded the program by performing a modified version of her song “You’ve got a friend [Aung San Suu Kyi],” while the honored guest held hands with the elected officials and actress on the stage, swaying back and forth and singing along. 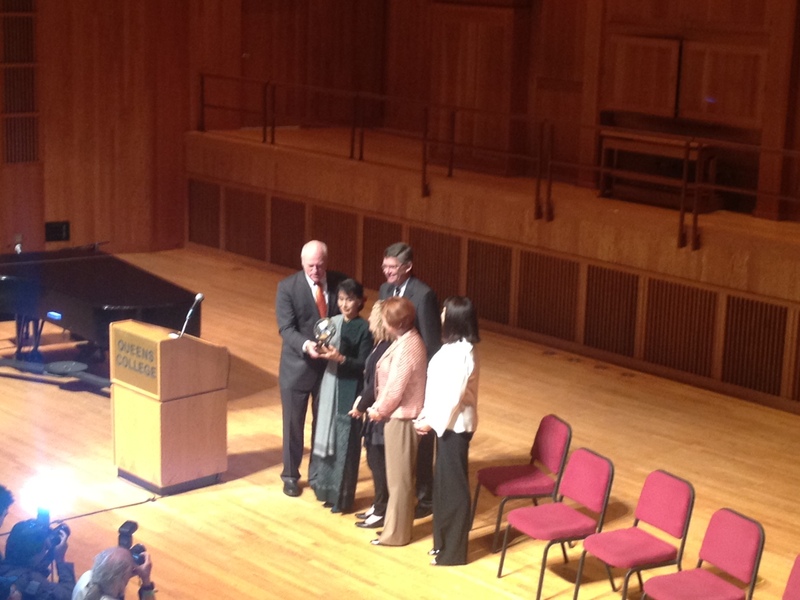 Crowley presented Aung San Suu Kyi with a miniature replication of the Unisphere from the World’s Fair in Flushing. “We wanted to give you something that represented, New York and the World,” he said. And the motto of the fair —Peace through Understanding— also seemed appropriate. 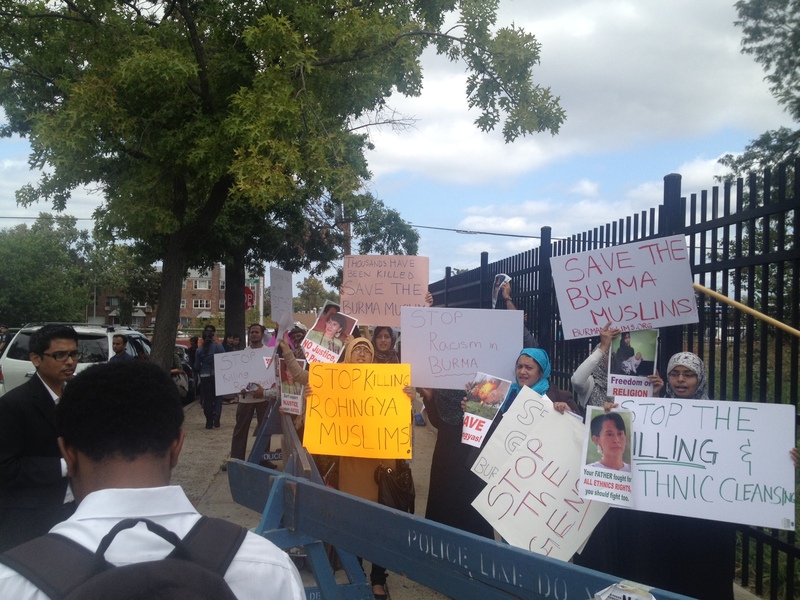 After the event, a rally had been organized drawing attention to the persecution of the Rohingya Burmese muslims. Protesters urged Aung San Suu Kyi and her party to be more vocal on this issue. 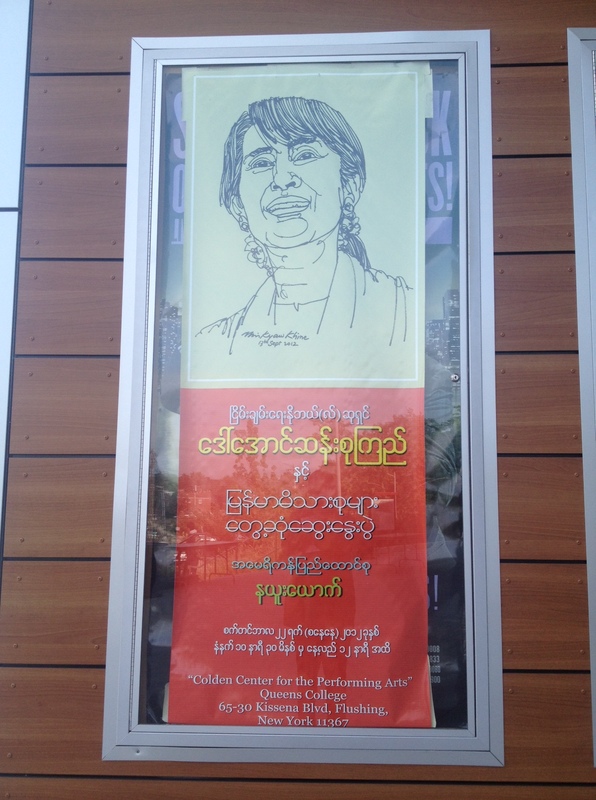 Posted in education and tagged Aung San Suu Kyi, Burma, Queens College.